in general, which of the two statements sounds more agreeable to you? 1. a male 40 year old professional violinist must avoid physical work such as shoveling snow or lifting heavy objects (such as boxes and furniture, when moving for example) in order to protect ones hands from possible injury. 2. it is totally okay for a male 40 year old professional violinist to do physical such as shoveling snow or lifting heavy objects (such as boxes and furniture, when moving for example). in general, which of the two statements sounds more agreeable? please expand on your opinion if possible. from childhood to old age, does this profession merit a special status in terms of what one can/cannot do with their hands? in other words, what is the proper hand care for a professional violinist or an aspiring professional? do violinists deserve a special status? emphasis is on physical work and exercise. maybe there is a special set of exercises for violinists? I have played just short of 2 years and in no way supporting me or my family. I know a now retired surgeon - ENT who always did very physical work, cutting down trees, chopping firewood, etc. I know a much younger general surgeon - who gardens, cut down trees, but would not work with stone for fear of smashing his hands A few years ago he quit using the chainsaw. I think he had seen someone who was cut with a chainsaw and the horrific damage it did. He was freaked by it realizing that could be him. I know a pediatric surgeon who did all kinds of yard work. One day I had to hold the intestines of a baby in my hands for a couple of hours while I waited for him to shower, clean up from his yard work and get to the hospital!! Anyway the ENT was responsible for curing people of ENT related things. The general surgeon was about saving lives. The pediatric surgeon was responsible for saving that baby's life. He kept me from caring for other sick baby's while I waited for him. FYI - the baby survived and did great! I am a gardener who never wore gloves until I started playing the violin. BUT I have become very, very careful and much more aware of where my hands are when I am working. How does shoveling snow do anything but strengthen your hands? One could walk outside and have a meteor hit them in the head. I wouldn't want to go through life worrying like that. Wife wants you to do some yard work does she? For a professional musician, an injury could mean not playing and that could result in some reduction or loss in income. I think at least reasonable care of the hands is warranted for any musician, professional or not. I think it is reasonable to be careful with power tools, knives, hammers, machinery, and so on. Basic shop, kitchen, garden and etc safety. I can't think offhand of where shovelling snow would be likely to cause injury, though. Not much chance of the hands or fingers getting cut, burned, broken or crushed. Wear gloves to avoid frostbite, if temperatures and windchill make it a possibility. But I'd say there is a more likely chance of an injury to the hands from taking a tumble when using the stairs. I know people who have broken fingers, hands or wrists that way, some of them musicians. You are probably not avoiding stairs, though. Because just expecting the wife or any other family members to do it because you are a musician is probably not going to go over well as a concept. It could even be another way of risking injury. 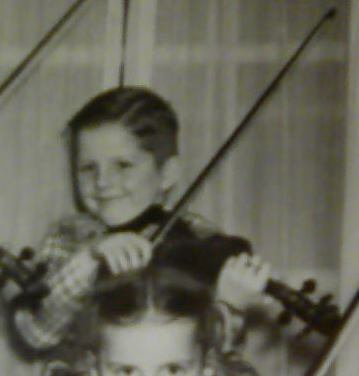 I know professional violinists that would never do anything but play the violin in fear that they might hurt themselves. If I had to worry about injury to my hands, I'd live in a bubble. Sure there have been a couple time's over the last year or so (since I came out of retirement) that I've injured a finger or a hand at work. I'm a cabinet maker and work with power tools all day long. I work with material such as plastic laminates, (i.e. Formica) where it's very easy to cut a finger (and I have a few times) and not be able to play for several days. The other day while cutting on the table saw, my fingers literally 1/4" away from the saw blade, I said to my co-worker, "OMG, if my hematologist could only see me now, she'd have a conniption fit". So I wouldn't worry too much about manual labor while playing violin, I'm sure symphony orchestra guys do other things beside's play violin. Sorry, I didn't mean to ramble on about my health. Enjoy and take care of the "honey do" list. Been thinking about you Ken. I hope you keep those talented hands safe and I send you love and vibes to keep those platelets HIGH HIGH. Nice to see you on the Jelly. Hope to see you soon or find you in chat. I am 57 and recently cut someones hedge with an electric trimmer that took me two days, after which I could barely lift a cup of tea! Even though I have spent most of my life working in physical environments. I would say for any pro musician to steer well clear of prolonged use of power tools or prolonged lifting that strain muscles in hand, wrist and fingers. I would be aware of safety and take sensible precautions, but live your life. If you just don't want to do yard work, etc, I don't blame you! Hire someone if you can afford it.